Today, we are releasing update for JA Social Feed plugin to work with new Facebook Graph API 3.0. The Graph API 3.0 comes with lots of major updates, you can find more information about the updates HERE and Graph API 3.0 changelog. JA Social Feed Joomla plugin imports content automatically from popular social media sites: Facebook, Twitter, Youtube, Vimeo, Instagram, RSS, Pinterest and Flickr and adds to the Joomla or K2 category as articles. 1. 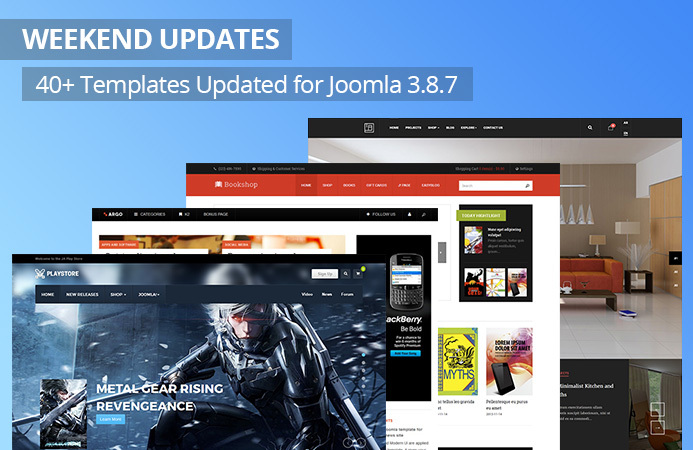 JoomlArt - 5 Joomla templates and 2 extensoins updated for Joomla 3.8.8, bug fixes and improvements. 3. 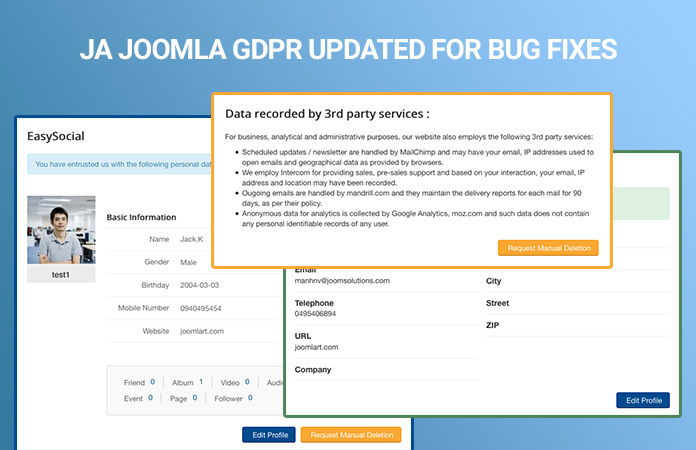 Joomlabamboo - JB Buildr Joomla template updated for Joomla 3.8.8, bug fixes and improvements. 1. 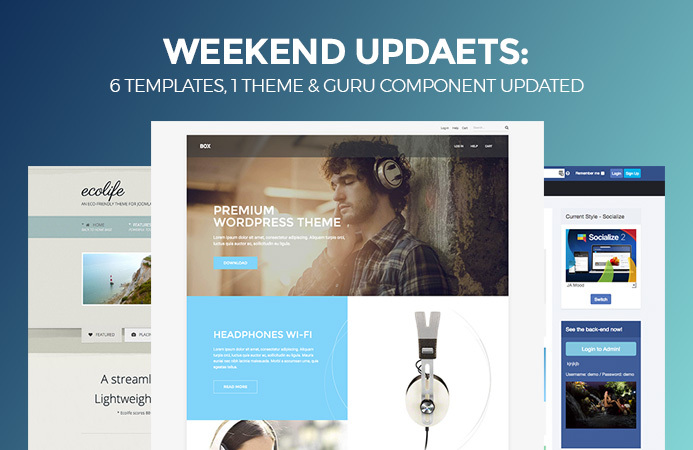 JoomlArt - 11 Joomla templates updated for Joomla 3.8.7, bug fixes and improvements. 2. GavickPro - 3 Joomla templates updated for Joomla 3.8.7, bug fixes and improvements. 1. Joomlart - 6 Joomla templates and 23 Joomla template quickstart package updated for Joomla 3.8.7, Bug fixes and improvements. 3. GavickPro - 1 Joomla template and 10 Joomla templates Quickstart package updaed updates. 1. 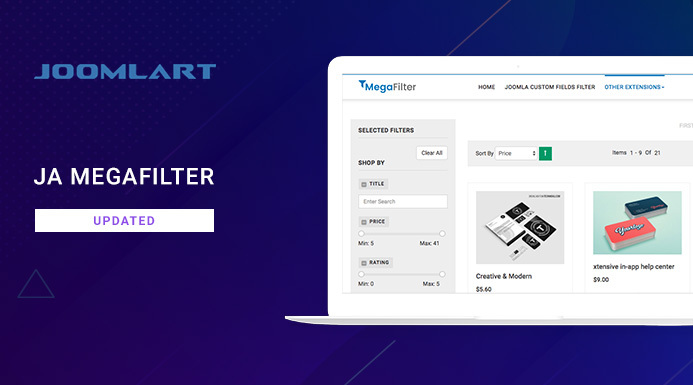 Joomlart - 5 Joomla templates and T3 Plugin updated for partial WCAG support, Joomla 3.8.7, Bug fixes and improvements. 2. 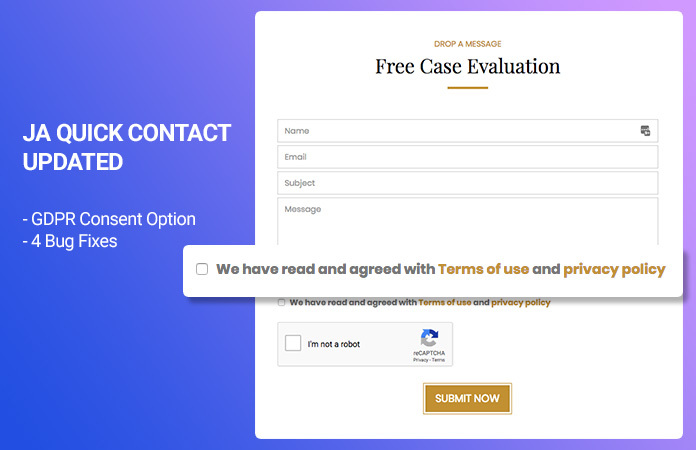 GavickPro - 2 Joomla templates and 2 modules updated for WCAG support, Joomla 3.8.7, Bug fixes and improvements. 3. 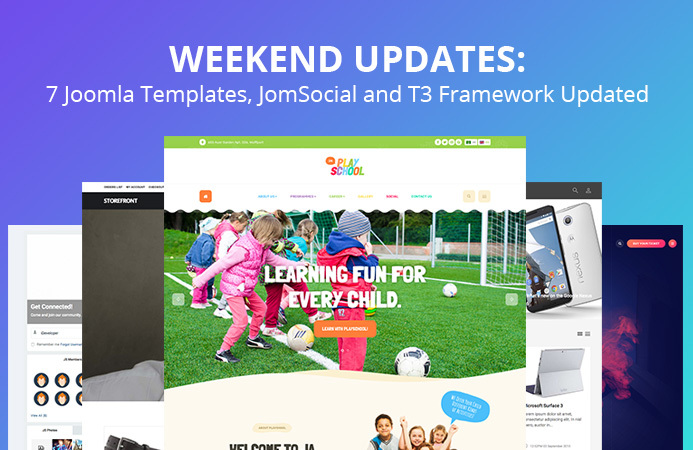 Jomsocial - Jomsocial Community Component version 4.5.2 updated for new feature, imporovments and bug fixes. 1. 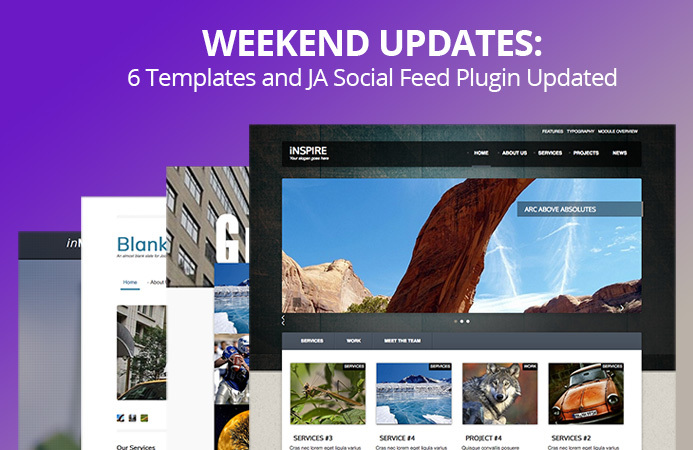 Joomlart - JA Social Feed updated for new Instagram API Platform support, bug fixes & improvement. 2. Joomlabamboo - 6 Joomla templates updated for Joomla 3.8.7, PHP7 support, Bug fixes and improvements. 1. 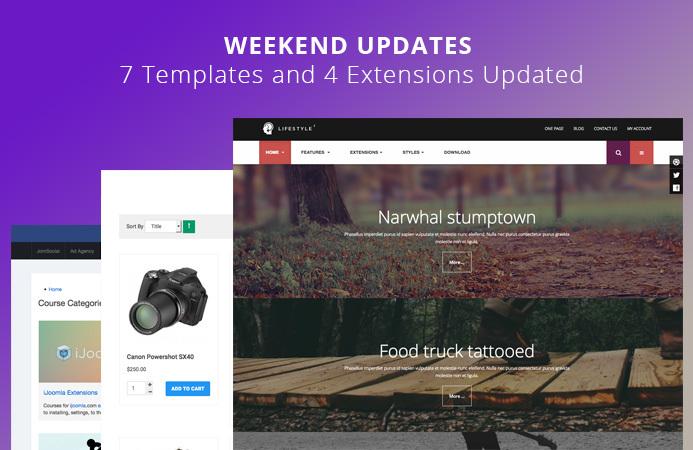 Joomlabamboo - 11 Joomla templates and 4 Extensions updated for Joomla 3.8.6, PHP7 support, Bug fixes and improvements. 2. iJoomla - Guru Component version 5.1.2 updated for new feature, imporovments and bug fixes. 2. 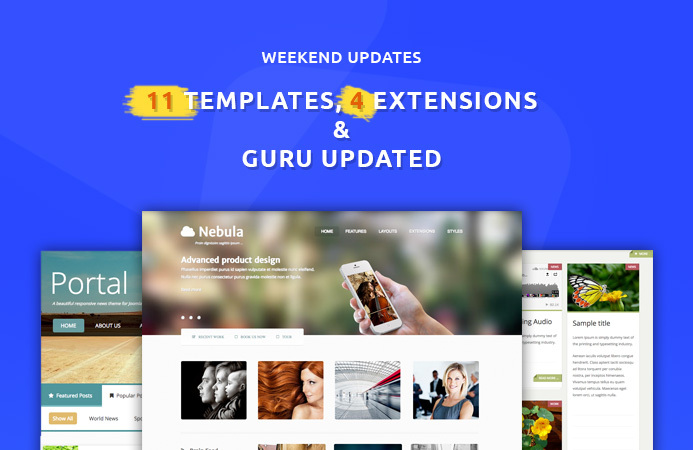 Joomlabamboo: 7 Joomla templates and 2 Extension updated for Joomla 3.8.6, PHP7 support, Bug fixes and improvements. 3. iJoomla: Guru Component version 5.1.1 updated for bug fixes. 1. 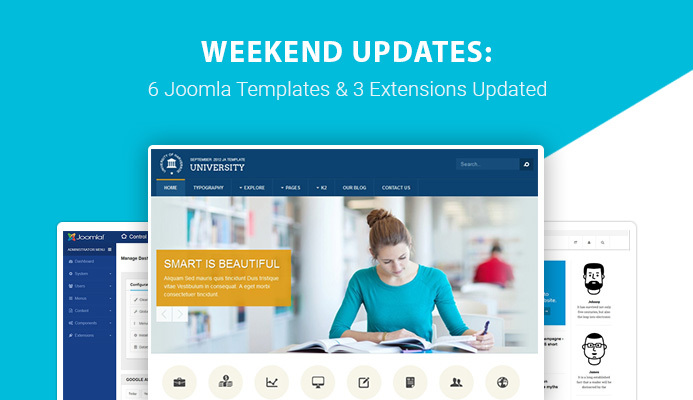 Joomlabamboo - 6 Joomla templates and 2 Extensions updated for Joomla 3.8.6, PHP7 support, Bug fixes and improvements. 3. iJoomla - Guru Component version 5.1.0 updated for new feature, imporovments and bug fixes. 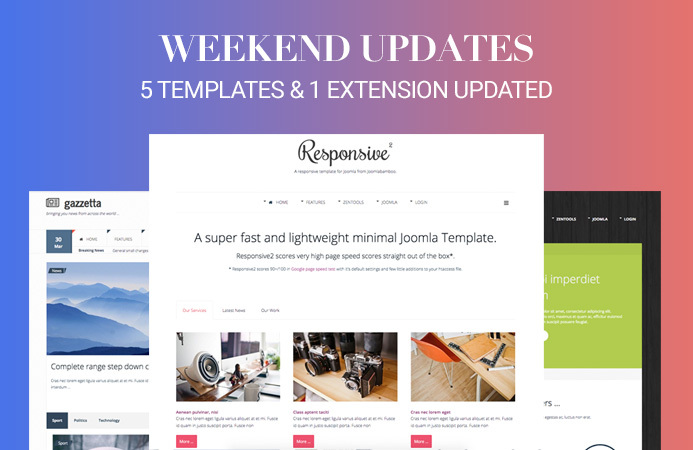 This weekend, We are releasing updates for 5 Joomlabamboo Joomla templates and 1 extension for bug fixes and Joomla 3.8.6 compatibility.